When activist Hugo Castro left his home in San Diego for Tijuana, it was just the most recent of his forays to help struggling immigrants in Mexico. He said he intended to join a caravan escorting Central American migrants on the dangerous passage north to the U.S. border. 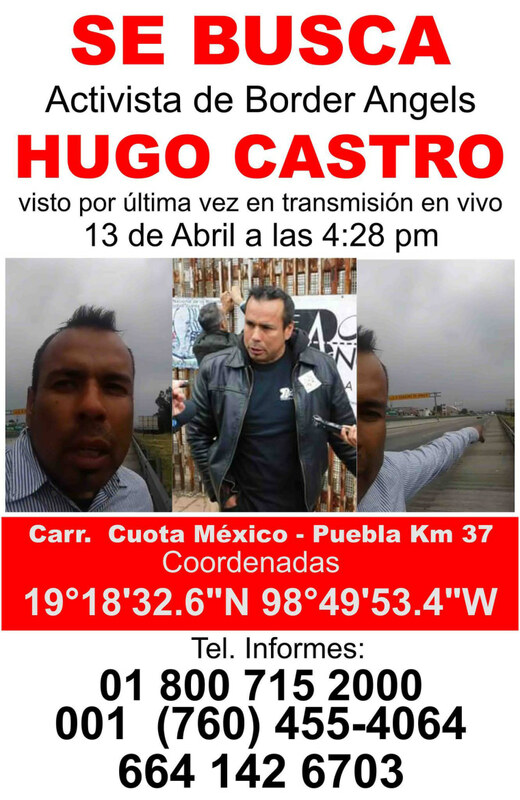 But more than a week after leaving home — and after he posted an frantic Facebook video saying he had been threatened by unidentified marauders south of Mexico City — family members and fellow activists are worried and have reported Castro missing. It's been a week since Castro, a 40-year-old U.S. citizen, was last in touch with the San Diego-based non-profit where he works as a volunteer. His supervisor at Border Angels, Enrique Morones, said the father of four clearly seemed distressed, but that no one knows what has become of him. Castro has been reported missing to consulates of both U.S. and Mexico on both sides of the border, to the Mexican Human Rights Commission and to that country's national police, Morones said. His partner told KPBS radio in San Diego she is scheduled to meet Tuesday morning in Mexico City with federal prosecutors to review security camera video that they hope will give clues as to his whereabouts. In his own 20-minute video, posted on Facebook Thursday afternoon, Castro says in Spanish, "I was threatened. They want to kill me," adding a short time later: "I need help. I need help." Castro's partner, Gaba Cortes, told KPBS that she missed a phone call Friday afternoon but called the number back and reached a taxi driver, who told her that he had driven Castro to Mexico City. The American reportedly said he still planned to head to the rendezvous point for the immigrant caravan, in the town of Querétaro, which is about 130 miles northwest of the capital. In the Facebook video, Castro appears alongside a freeway and says he is the road that connects Mexico City with the city of Puebla, to the southeast. The American reports that his cell phone battery is running low and that he does not have a lot of money. He mentions others who have disappeared in Mexico and says, "Please, someone come. . . . I don't know what else to say." Castro has been working odd jobs to pay the bills but devoting most of his time over the past decade to aid immigrants in Mexico, according to Morones. Both men work for Border Angels which, according to its website, is an "all-volunteer, non-profit organization that advocates for human rights, humane immigration reform, and social justice." Castro had been featured a week ago by KPBS for his work aiding Haitians stranded in Tijuana and Mexicali after the U.S. toughened entry rules on the Caribbean refugees. The story depicted Castro bringing food to shelters and confronting an aid worker who appeared to no longer be welcoming the foreigners. Castro said that he did not believe in the leaders of Mexico or the U.S., adding: "But I do believe in the people. So we, the people, el pueblo, are the ones who are bringing the change." Morones said it was not uncommon for volunteers working along the border to be threatened by smugglers and others who making money by preying on migrants. "About three weeks ago, Hugo was threatened," Morones said. "He was trying to help these Haitians and people who were trying to take advantage of them said 'It's none of your business. Stay out of it.' " Morones said he told the volunteer to file a police report about the intimidation. In joining the caravan escorting Central Americans from Querétaro, Castro intended to raise awareness about the plight of the migrants, many of whom cannot get asylum in the U.S. Smugglers and others have robbed, raped and beaten the immigrants. Castro's sister, Angie Velazquez, said via email that her brother had helped hundreds of people, but he declined to "brag about it" or seek attention. "He has the kindest heart," she said. "He helps, whether he knows you or not; he helps with no strings attached."